Primary Inspired: Shark Week! Let's Hop! It's SharkWeek! One of the most interesting weeks of the year..right? awesome shark-themed activities, will we? 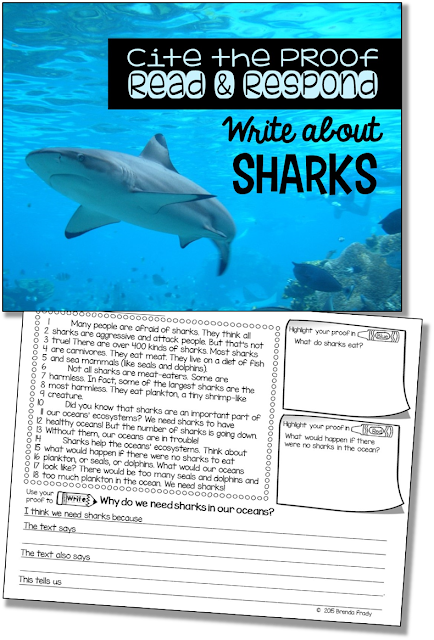 I've been working on some writing tasks for my kiddos over the summer. One of the skills we really tried to hit hard was citing evidence from the text in written responses. I've discovered that with practice, they were awesome at locating the evidence...but when it came to using that evidence within a written response, that was a different story. This activity guides my primary kiddos through the process. They highlight evidence, then use that evidence to write a response to a question. I've built in supports with sentence starters so that they can learn/practice the framework of a good response. I'm really excited about the difference this will make for my kiddos written text responses, & I hope you enjoy using this in your classroom, too! Just click the image to grab your copy. 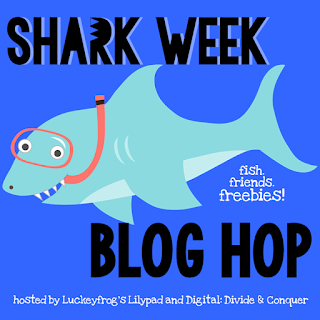 Make sure you click on the button below to head on over to Crayonbox Learning & snag another shark-tastic freebie!